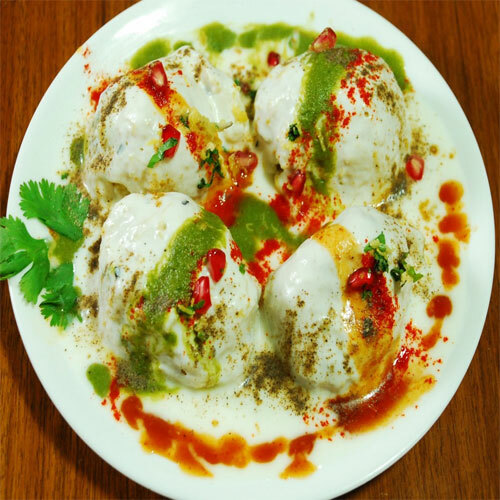 Dahi Vada is one of the most popular snacks in India and is also a festival favourite. Beat daal well to make it light and fluffy. Heat the oil. Shape the wadas and fry in hot oil, to a golden brown over medium heat. Lift out of the oil and put into a pan of salted water. Repeat this with the rest of the batter.Mix the salt, 1 tsp of the cumin, 1 Tbsp of the coriander leaves and black pepper into the yogurt. Squeeze out the fried bhallas and arrange them on a serving dish. Cover it with yogurt garnish with the rest of the cumin, coriander leaves, chilli powder, kala namak and chaat masala.